Can an artist intervention translate contested spatial and racial narratives that define the real and imagined landscape of New York? The Red Line Labyrinth brings together discursive, often unruly and seemingly disconnected fragments of Johnson's research and family history of property ownership in Brooklyn. Through an examination of this material and visual culture, the past is made visible in the present. 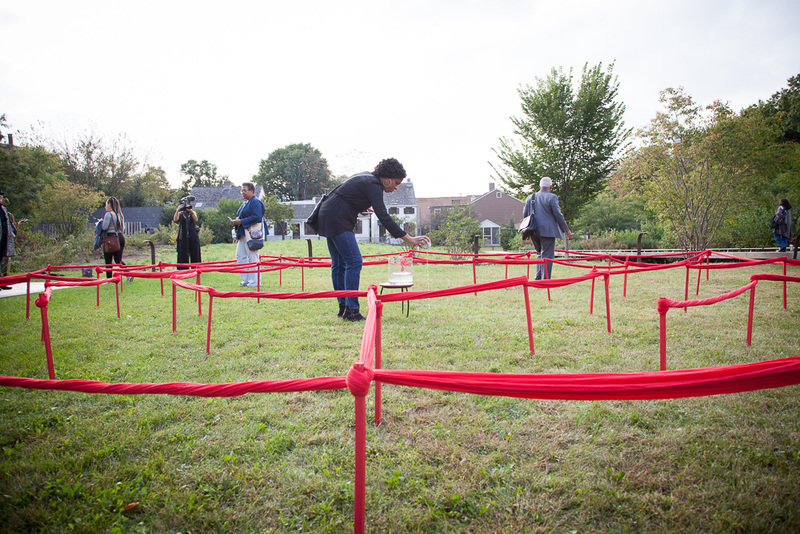 As part of an on-going exploration of walking as research practice and the historical legacy of U.S. Federal Home Owners Loan Corporation’s 1938 Red Line Map, Johnson developed two performative works--a labyrinth walk and a “live cinema” performance that build upon these resonant themes. Each work addressed the relationship between present-day political urgencies including gentrification, displacement and the historic practice of race-based, real estate redlining. Solvitur ambulando is a Latin term which means "it is solved by walking" and is used to refer to a problem which is solved by a practical experiment. When carrying the burdens of the past, our relationships suffer and our creativity is limited. Myths of the American Dream and “bootstrap” economics often obstruct dialogue about the reality of our social and economic lives impacted by the racial and economic discriminatory mapping process of redlining, which are multilayered, structural and systemic. Labyrinths have been used throughout human history (the earliest was found in Egypt) as a means to inspire change and renewal in individuals and communities. When we walk into the path of the labyrinth, a new world is revealed. Woven in this experience is a new vision of reality that we cannot yet grasp. The Labyrinth invites local residents to join as we contemplate together the legacy of redlining to see what solutions might emerge. How might we begin to “re-map” or create a “new” geography and collective record of New York urban space that is inclusive and empowering for black people, communities of color, the working class and all New Yorkers? The Red Line Labyrinth may help provide new answers and, perhaps, a way forward. In Fall 2017, Walis installed her labyrinth at Weeksville Heritage Center and Brower Park in Crown Heights, Brooklyn. She invited participants to walk the Labyrinth alone or in pairs to activate reflection on healing and the experience of pilgrimage. In the Spring of 2018, Walis Johnson and artist Paul Sue-Pat had a joint exhibition, East New York: We Walk in a Field of Dreams. This community art project was the culmination of a series of community workshops known as Civ Lab. Each artist created work centered around meditations on shared histories of the community in East New York. The installation incorporates old shoes that poetically embody footsteps of a resilient people who have come, gone, or still reside in East New York. These shoes are coupled with audio from East New York Oral History by Sarita Daftary-Steel. The installation is a space to house and record reflections on community stories. The Red Line Archive is a mobile public art project that engages New York City residents in a conversation about race and the history of the 1938 Red Line Map that helped create the segregated urban landscapes of the city. 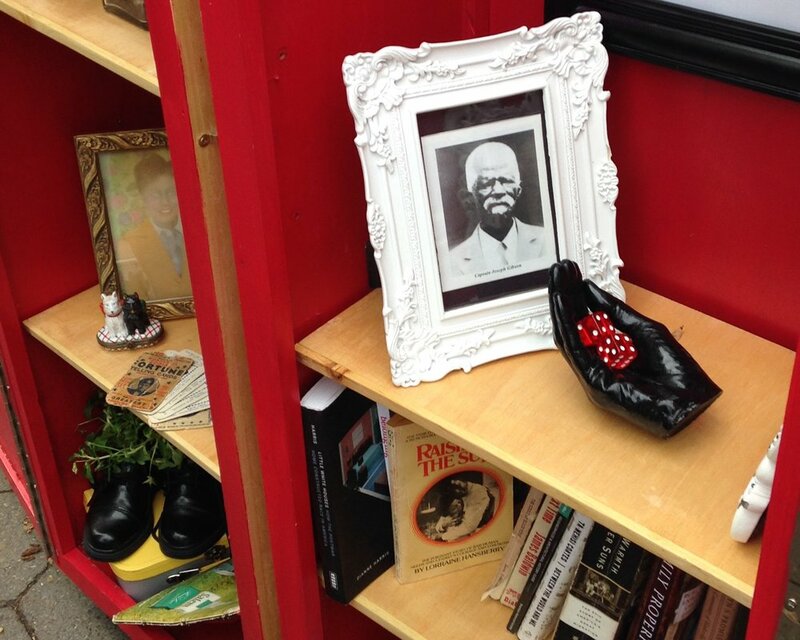 The “cabinet of curiosities” is wheeled along city streets and invites people to freely associate about personal artifacts and documents from the artist’s family history in gentrifying Brooklyn and ephemera collected during four artist walks in and along the periphery of redlined neighborhoods. Walis Johnson is a multidisciplinary artist/researcher and educator whose work documents the experience and poetics of the urban landscape through oral history and ethnographic film, performance and artist walking practices. She is particularly interested in the intersection of documentary film and performance. Her practice consists of multiple works, in a range of different media, grouped around specific themes and meanings. The Red Line Archive was exhibited in the Art in Odd Places Festival 2016. Walis has an MFA from Hunter College in Integrative Media and Documentary Film and taught at Parsons School of Design. She has extensive experience in policy and philanthropy, collaborating with community-based organizations citywide, in New York City, San Francisco and nationally.